Rich and hearty, this is a great stew to make during cold winterÂ months or anytime you want a hearty stew filled with beery goodness. 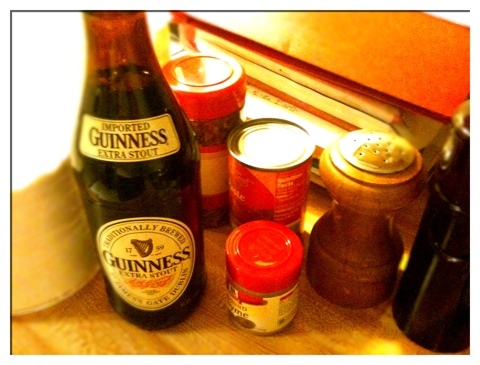 This recipe is designed to be made with the unique flavor of GuinnessÂ but that doesn’t mean that you can’t experiment with other stouts andÂ porters! Serve it with the same beer you use to make it. Toss beef in a large bowl with 1 Tbsp of oil. Mix the flour, salt andÂ black pepper and red pepper. Add to beef and toss until the meat isÂ evenly coated. Dissolve the tomato paste in a cup or so of the beer. Heat 2 Tbsp oil in a large frying pan over med-high heat. Brown the beef on all sides. Add onions, garlic and the beer/tomato pasteÂ mixture. Reduce heat to simmer. Cover and let cook for 5 minutes. Empty the frying pan into a casserole dish and return it to the heat. Increase heat to medium and add enough beer to cover the bottom. Boil and stir to dissolve the caramelized meat juices in the pan. Empty the pan into the casserole dish. Add the rest of the beer, theÂ carrots and thyme. Stir and taste to see if you want to add more salt, pepper, etc. Cover and simmer on the stove top or bake at 300 degrees F for 2Â hours, more if you’d like. Taste and adjust seasoning. Scatter chopped parsley and serve.